This is what was leftover after I finished making this next #sweetonoakland cookie. 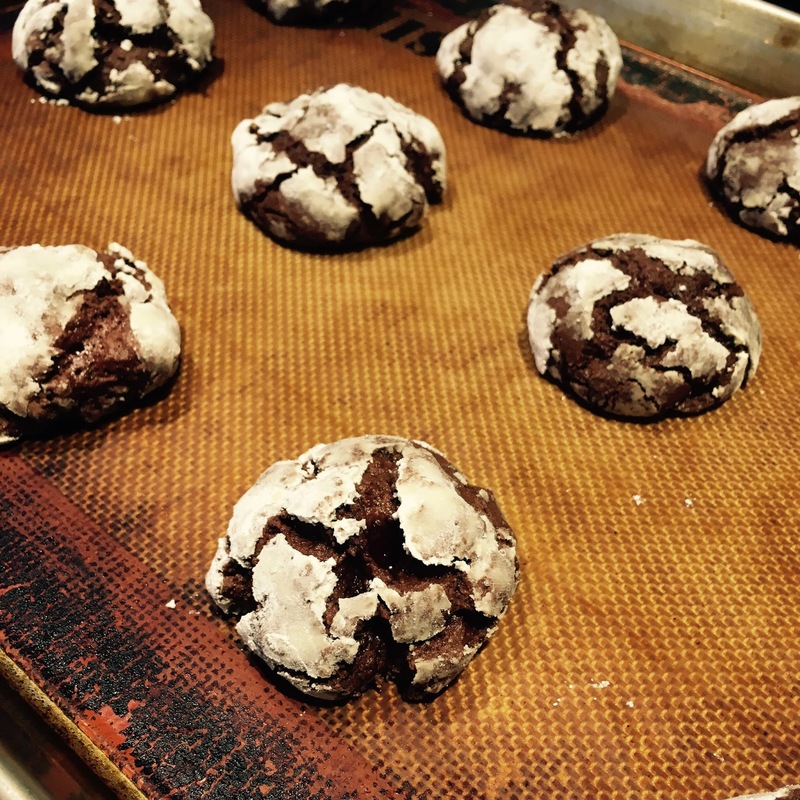 Introducing The Rockridge: A Chocolate Glazed, Citrus-Infused Soft Biscotti. Like the Temescal neighborhood of Oakland, Rockridge was historically an Italian-American community. But who wants a hard, crunchy cookie, amirite? Maybe you do. But did you know biscotti actually refers to any Italian cookie (like biscuit in England). What you have in mind is probably cantuccio. But I digress. 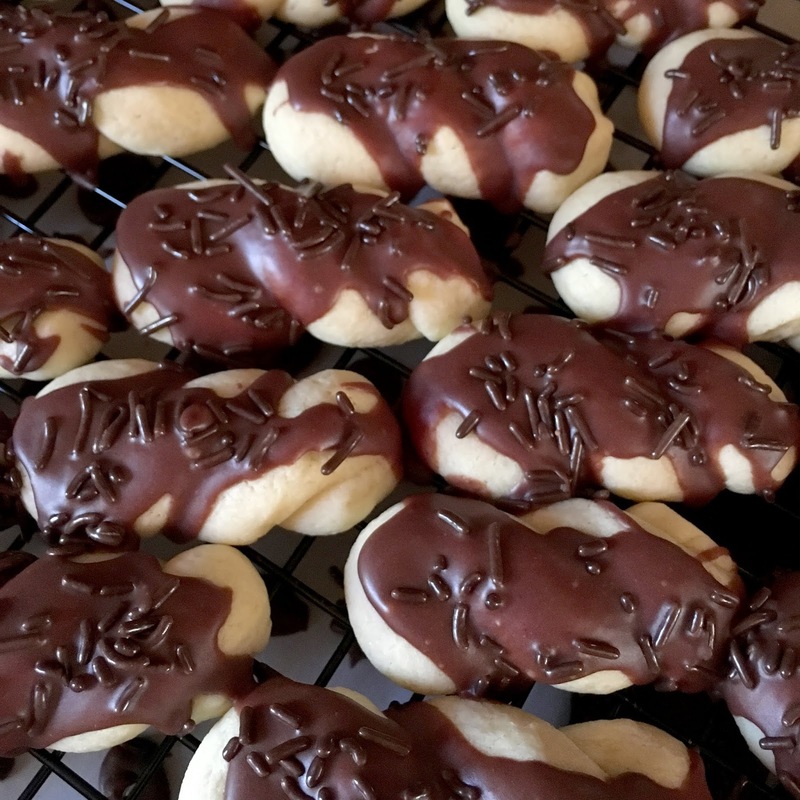 Italian lesson aside, these cookies are only baked once, infused with triple citrus zest, and glazed in chocolate, finished off with chocolate sprinkles. Citrus zest because it's that time of year in California and chocolate covered because, duh, everything is better with chocolate on top! Preheat the oven to 350 F. Cream butter and sugars until smooth. Add eggs and vanilla and mix until completely combined, then add in citrus zest. Slowly add in flour, baking powder, and salt until just combined. Lightly dust work surface with powdered sugar (yes, powdered sugar...trust me). Take a 1/4 cup scoop of dough and roll it out into a long rope about the thickness of your pinky finger. Cut the long rope into 5-inch sections. Gently fold each section in half to form a U shape, then twist, pinching ends together gently. 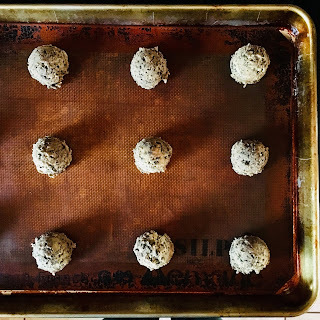 Transfer to a Silpat or parchment-lined baking sheet, allowing about two inches between each cookie. 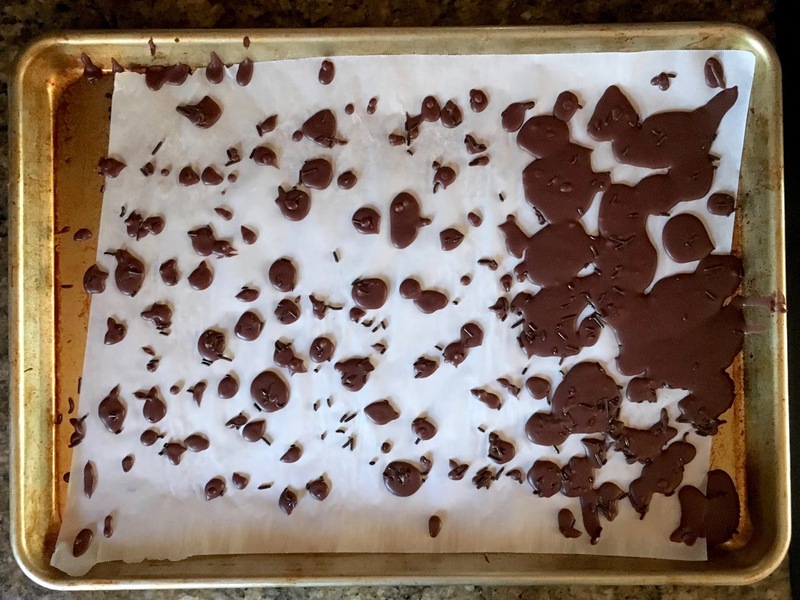 Bake for 10-12 minutes, turning the baking sheets halfway through. Remove from the oven when the edges are just barely starting to turn golden and the cookies appear set. Cool for 5 minutes on the baking sheet, then remove to a wire rack to finish cooling completely. Once the cookies are completely cooled, mix all glaze ingredients until smooth, adding more hot water as needed for desired consistency. Dip or drizzle onto cookies and allow glaze to set, adding sprinkles before that happens, if desired. Enjoy! 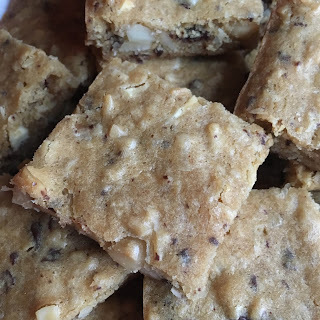 Did I mention in my last post that I'm coming up with new cookie recipes at a rate of one per month right now because I donated a six-month subscription to my kids' school fundraiser back in November? It's provided pretty good motivation to keep going and there are no shortage of Oakland neighborhoods from which to draw inspiration! Without further delay, here is the 7th cookie in this project, The Temescal: an Ethiopian-spiced, Stracciatella-style Chocolate Chip Cookie, inspired by what was once a predominantly Italian-American community until the late 1960s (not unlike neighboring Rockridge, which I'll get to next) combined with its more recent concentrations of Ethiopian and Eritrean immigrants and restaurants. First, to make ras el hanout combine 1 teaspoon each cumin, ground ginger, and salt with 1/2 teaspoon each ground cinnamon, coriander, allspice, and cloves, plus 1/2 teaspoon cayenne, cardamom, turmeric, and black pepper (you can store the leftover spice blend in airtight container at room temperature for up to one month). 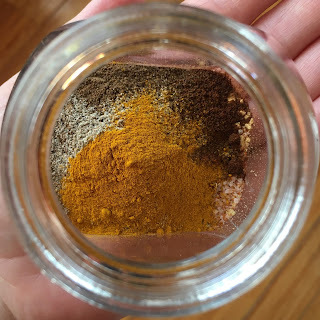 Now that you have the Ethiopian spice blend on hand, you can get to baking! Preheat oven to 360F/180C and line a baking sheet with a Silpat or parchment paper. 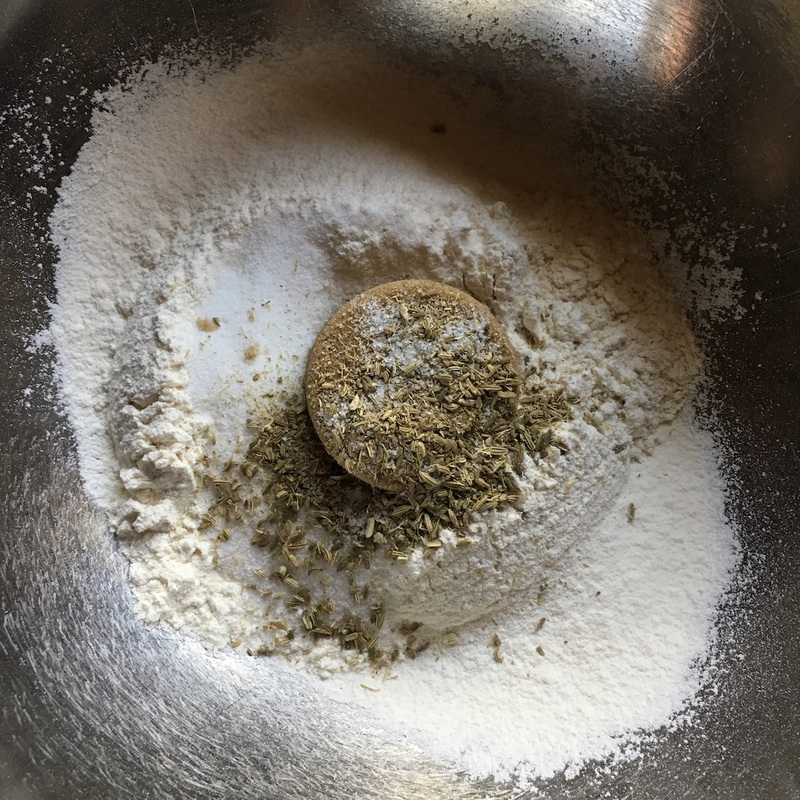 Whisk sifted flour, salt, baking soda, and ras el hanout together in a bowl and set aside. Beat the butter, cream cheese, and sugar until fluffy, then beat in the egg and vanilla. 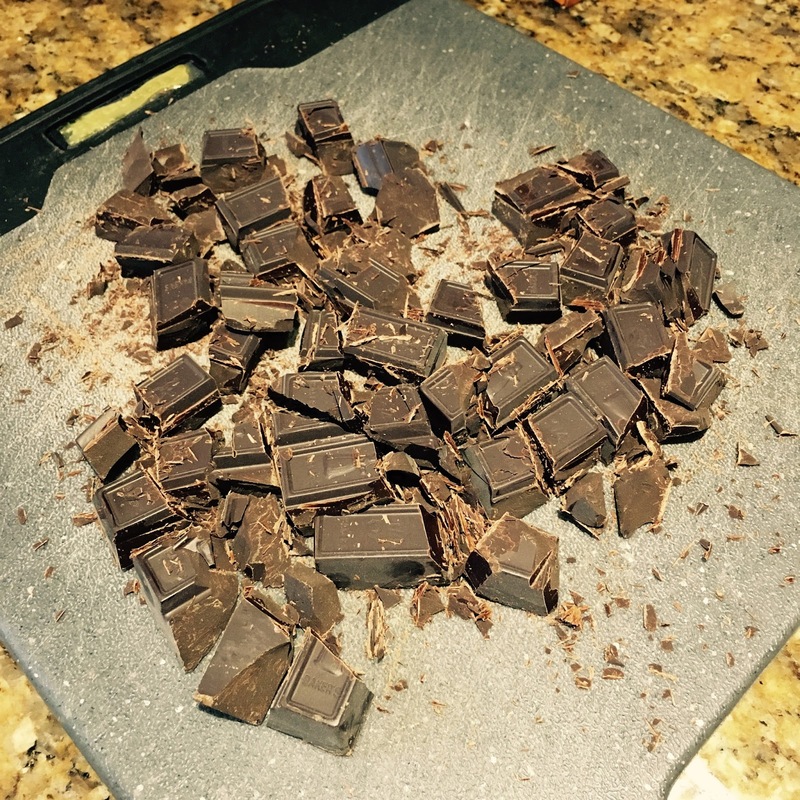 Add the dry ingredients and fold until just combined, then add the shaved chocolate and fold until just incorporated. 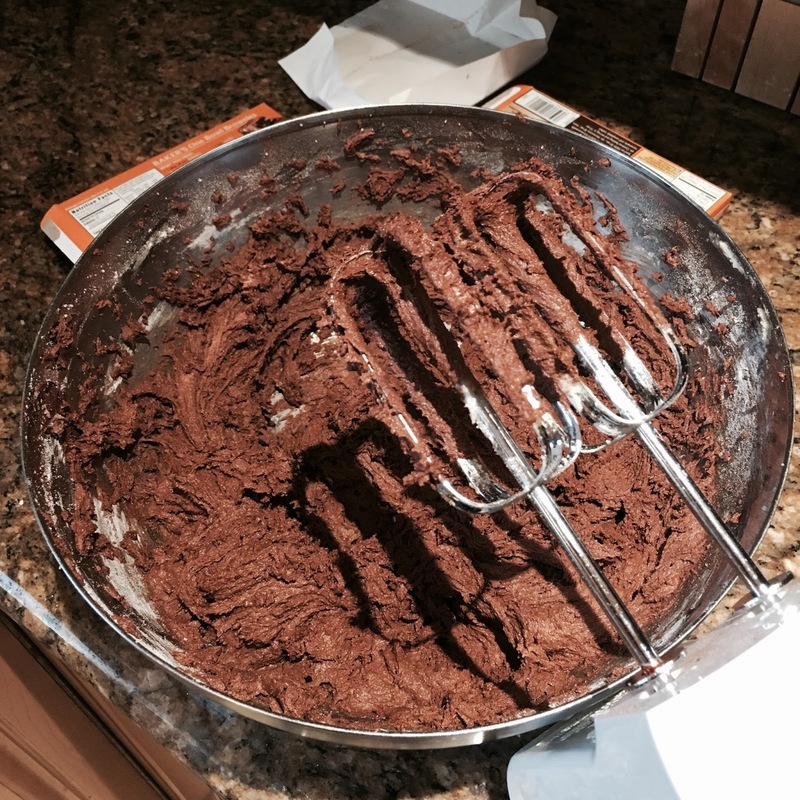 Place heaping tablespoons of dough (or use a #40 cookie scoop) onto the sheet, leaving a little space between. Bake for about 12 minutes until starting to brown at edges. 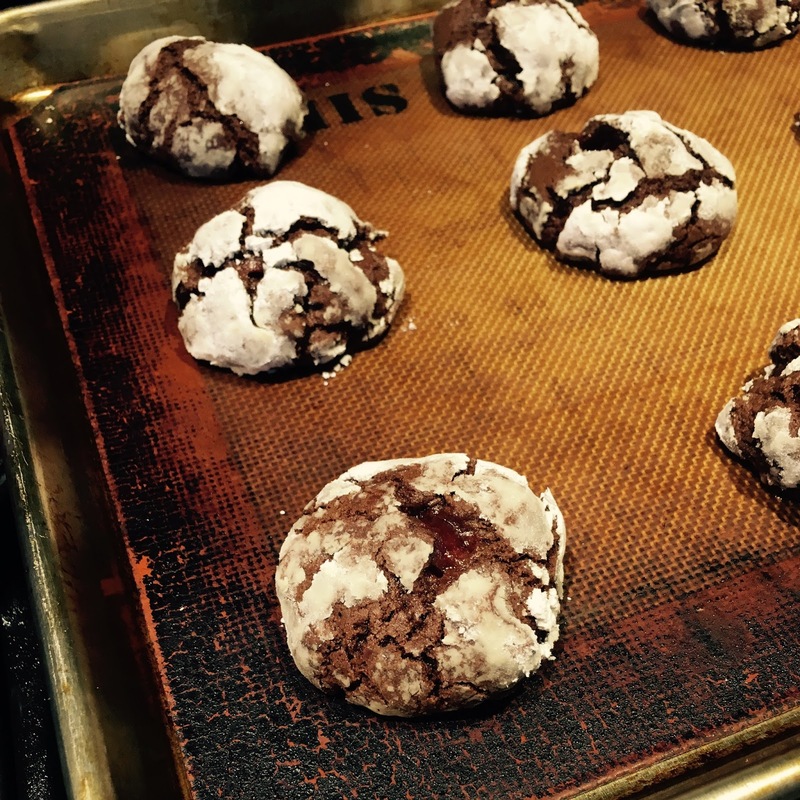 Let cookies cool on the baking sheet for a few minutes before transferring to wire rack to cool completely. This recipe makes about two dozen cookies - enjoy a couple with a cup of turmeric tea! Other than the fennel seed inspiration, that's about it for the connection to the Mosswood area, although I suppose you could draw some comparisons to the changing dynamics of this and most other neighborhoods in Oakland (did I mention this cookie is vegan?). Here's the how-to if you're interested in making a batch of these yourself. Preheat oven to 350F/180C. Grind the fennel seed to a powder in a mortar or use a spice blender. In a bowl, mix the flour with the sugars, fennel seed powder and the salt. Add the olive oli. Knead until you have a smooth dough. Roll out dough on a flat surface and cut with a cookie cutter. Small, simple shapes work best because the dough is brittle. I used small ornaments because it was almost Christmas. 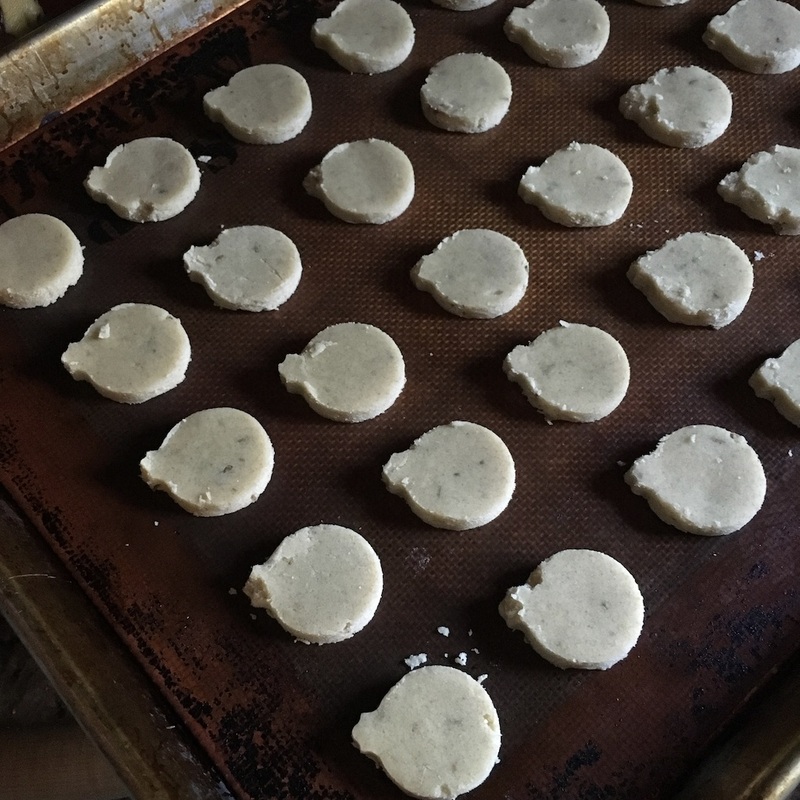 Place cookies on a baking tray lined with parchment paper and bake for 15-18 minutes. 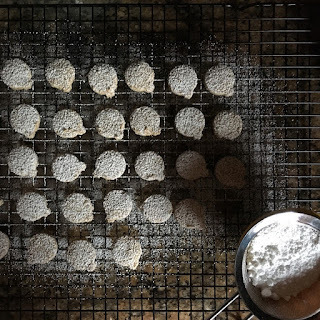 Place on a cooling rack and decorate with powdered sugar. Makes 2-3 dozen. Enjoy with all of your vegan friends! For a date day a few weeks ago, my husband and I went on a walking tour of the four apartments we lived in in the Adams Point neighborhood of Oakland between 1999-2005 and then again for one year in 2009-10 (following a four-year detour to attend grad school in Boston, before we moved into our current home in the Laurel neighborhood). Which is probably why, for the next cookie in this "sweet on Oakland" project, I turned to the Adams Point neighborhood for inspiration. Problem is, that neighborhood, as lovely as it is, is mostly residential. Its history revolves essentially around the family who owned the land - the Adams family - who were eventually forced by the city to sell the huge, increasingly centrally located plot of land for development in the early 1900s. But of course my memories of the area are wrapped up in all the things we could easily walk to - uptown and Bart in one direction, Piedmont in another, Grand Lake/Lakeshore clockwise from there, and of course the lake itself. The thing that drew me to the area initially was the office building where I worked throughout my college years (now one of the Kaiser buildings - I had a parking spot in a lot where the cathedral now stands). That and food. One or two mornings a week I'd walk to Arizmendi for scones (we'd share an oat scone and a currant scone). Occasionally on a Sunday morning we'd walk a little further to Lynn & Lu's for their amazing oatmeal pancakes with blueberry compote. 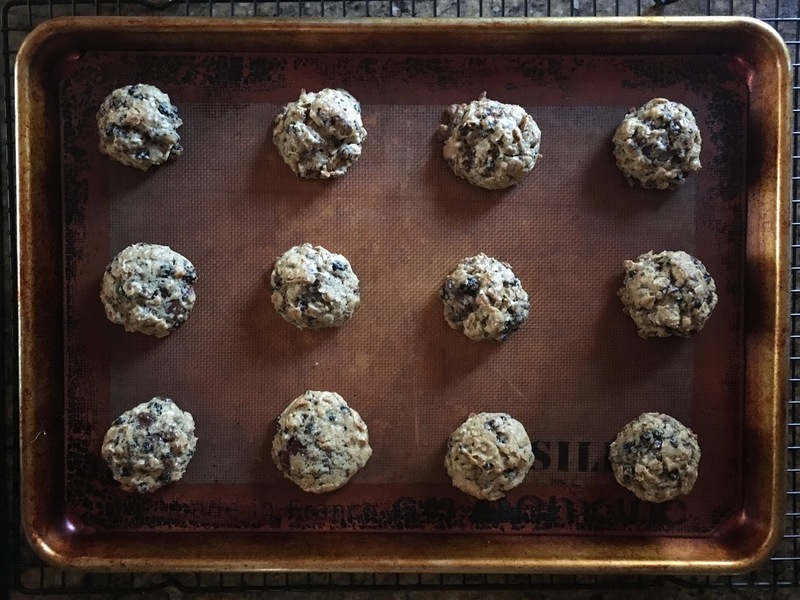 There are more food memories, of course, but for this recipe, I essentially made a cookie version of Arizmendi's oat scone - the dried blueberries (instead of currants) are a nod to that blueberry compote at Lynn & Lu's. I threw in some chocolate because chocolate makes any oatmeal cookie recipe exponentially better. Whisk together flours (don't forget to sift the white flour! ), baking soda, and salt and set aside. Cream butter and sugar for a couple of minutes until light and fluffy. Add egg and cream and mix well. 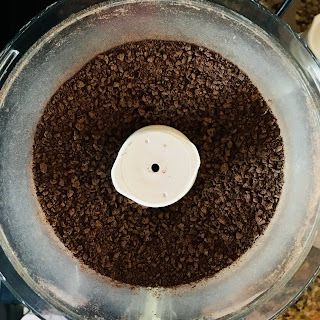 Slowly add dry ingredients to wet just until mixed. Using a wooden spoon (yes, this is essential), mix in the oats, dried blueberries, and chocolate. Chill dough in the refrigerator for about 10 minutes while you preheat your oven to 350 degrees Fahrenheit. Chilling the dough makes it easier to scoop and allows the oats to soak up the cream. 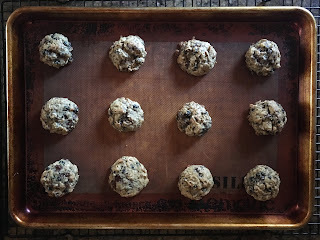 Scoop cookies into 1 1/2 tablespoon (I like to use a #40 scoop) mounds, spacing them apart on a parchment paper or Silpat-lined baking sheet. Bake at 350 for 12-13 minutes, until the edges are light brown. The Dimond - a German inspired sugar cookie with apple cider buttercream! I had very good intentions to revive this project last fall, after I quit my full-time day job to spend more time with my kids and in my studio. But when my idea for a cookie inspired by Oakland's Dimond district flopped miserably I never really returned to the idea. Fast-forward almost a year and I'm finally making progress on the projects that carried over from my school-year to do list to my summer to-do list, both kids in tow 24/7. In other words, it's taken me well over a month to get around to getting much of anything done this summer. Taking care of kids really is a full-time gig! Without further delay, I present to you The Dimond! This is a Heidesand-inspired sandwich sugar cookie, half dipped in sugar crystals, half dipped in chocolate sprinkles, with an apple cider buttercream filling. Heidesand is a traditional German browned butter shortbread cookie. 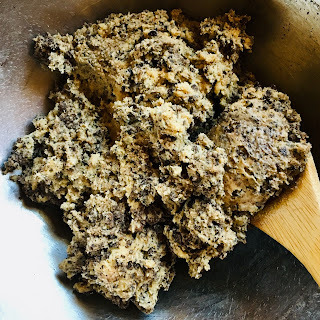 The browned butter part in the original recipe I attempted was divine but the shortbread dough was so dry I struggled to form it into a log I could slice without crumbling. This time around the cookie is more like a soft sugar cookie - easier to make, tastier to eat (in my opinion). I was inspired by the many historic buildings in the Dimond, named after Hugh Dimond, notably the Altenheim, originally a retirement home for German Americans. Furthermore, in the early 1900s the area was known as Little Germany and is also now home to the annual Oaktoberfest, hence the German recipe at the core of this cookie. The area used to boast several fruit orchards, mainly apricot and cherry, but I felt an apple flavored buttercream would best suit this cookie (and it was fall when I first attempted this recipe so that's probably why I went with apple then though now I'm wondering if cherry or apricot would be more fitting!). 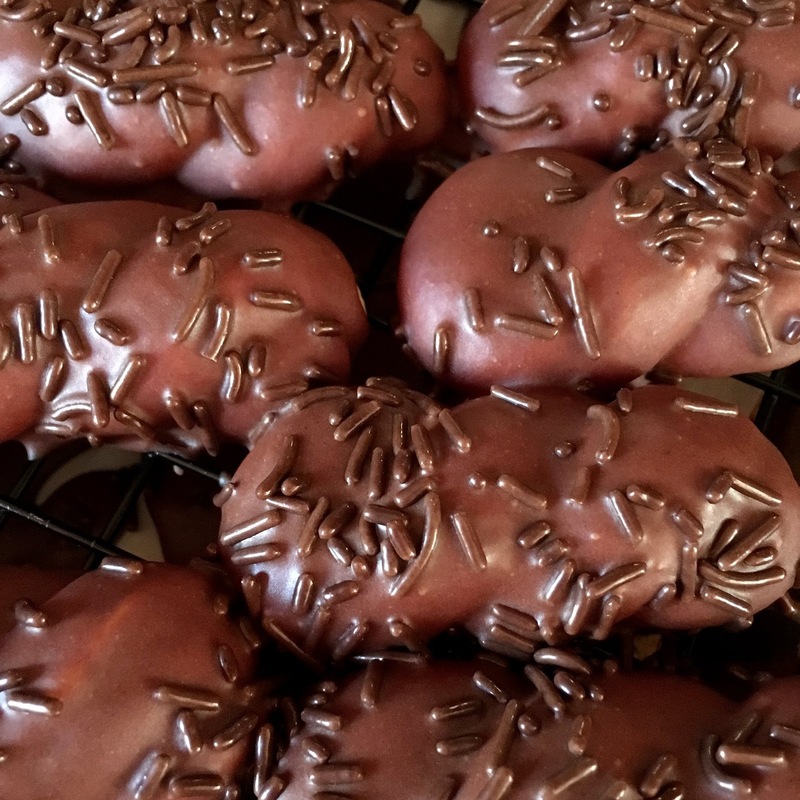 The crystal sprinkles sparkle like diamonds and the chocolate sprinkles - well, everything's better with a little chocolate in it! Cream butter and the sugars in a large bowl until fluffy. Add egg and vanilla to butter/sugar mixture and blend well. In another bowl combine flour, baking powder, and salt. Slowly blend flour mixture into butter/sugar mixture until incorporated. 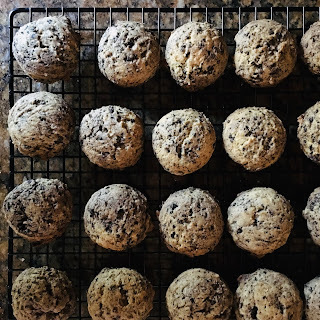 Use a cookie scoop to form dough into 1-inch balls. 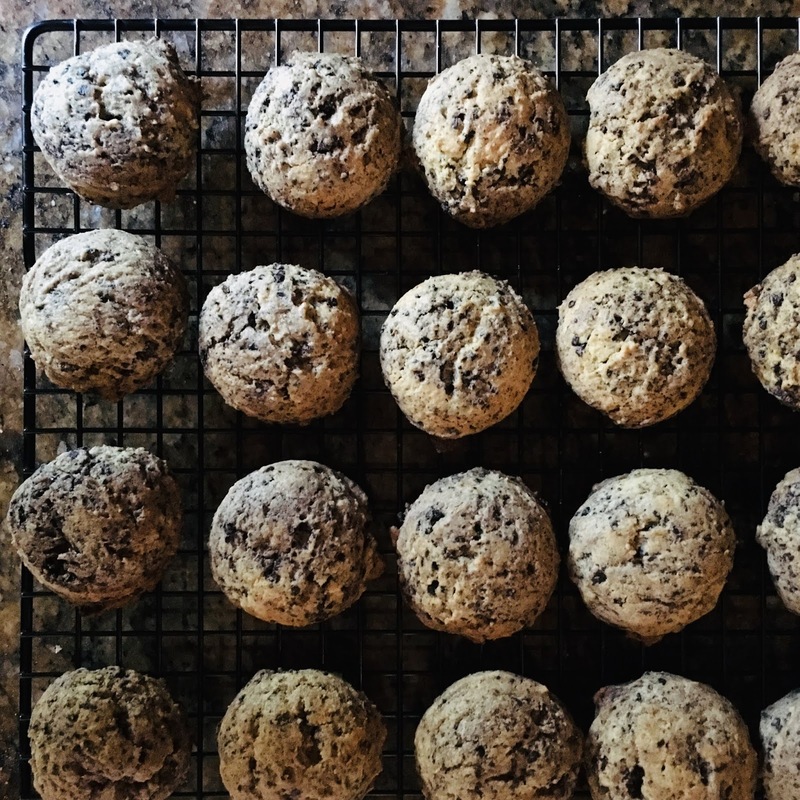 Alternate rolling balls of dough in sugar and chocolate sprinkles, place on a cookie sheet lined with a Silpat or parchment paper, and flatten. Bake at 350 degrees for 12-14 minutes, until very lightly brown. Cool completely before filling. *using 4 tablespoons boiled cider yielded a subtle apple flavor; if you prefer a stronger apple flavor, use more! Beat together the butter, salt, and boiled cider until fully combined. Gradually add the sugar, beating until the frosting is light and fluffy. Add the cream, if necessary, to make the frosting nicely spreadable. I like to pipe out a swirl of frosting onto the bottom of the base cookie, leaving about a 1/2 inch border around for spread. Top each frosted cookie bottom with another cookie and you have yourself a Dimond, Oakland inspired cookie sandwich! Enjoy. Long time, no cookies! Felt I was overdue for an update and I was craving blondies, which is really weird because that is not a "cookie" I typically crave. However, I've always kind of thought of the Montclair neighborhood of Oakland, diverse as Oakland is overall compared to this particular area within Oakland, as the blondie of 'hood cookies, if you feel me. The neighborhood, like the cookie, I can't lie, is not among my favorites. I lived in Oakland for about a decade before I even knew it existed, driving along 13 one day, not a route I typically took when I lived in the Lake Merritt area, and noticing the Lucky supermarket out of the corner of my eye (grocery stores at the time were pretty lacking in the area so a supermarket not already on my radar was a supermarket to try out right away!). Another decade later, I've now sent both kids to a part-time daycare in Montclair, have a handful of friends who've lived or currently live in the neighborhood, and occasionally pop up that way for a particular store or restaurant. But I still find it to be a bit lacking in all the things I value about the rest of this town. What can I say, I'm more of a Laurel or Fruitvale gal. Heat oven to 350 degrees F. Line an 8-inch by 8-inch metal baking pan with parchment paper. For today's Oakland-inspired cookie, I'm thinking of the Fruitvale district, historically known for the many fruit orchards ("Fruit Vale"), primarily apricot and cherry, that dominated the area in the late 1800s. The area became part of the City of Oakland in 1909 and his now home to Oakland's largest Latino population. To celebrate Oakland's Fruitvale district, I present a bit of a twist on Mexican Chocolate Cherry Rounds. I could not for the life of me find candied cherry halves, as this recipe calls for, but I did have a jar of maraschino cherries in my fridge. 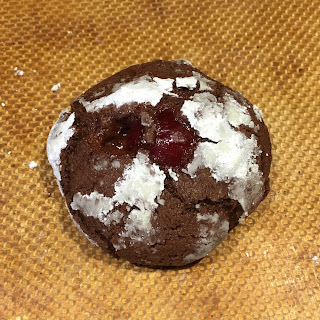 So I decided to bake the cherry in the cookie, similar to this recipe. Delightfully surprising, as Oakland tends to be. 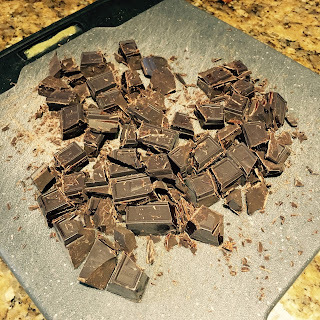 Melt chocolate in top of double boiler over simmering water (or in microwave) until smooth; allow to cool. Combine flour and next 5 ingredients in medium bowl. Using electric mixer, beat 1 3/4 cups sugar and butter in large bowl until light. 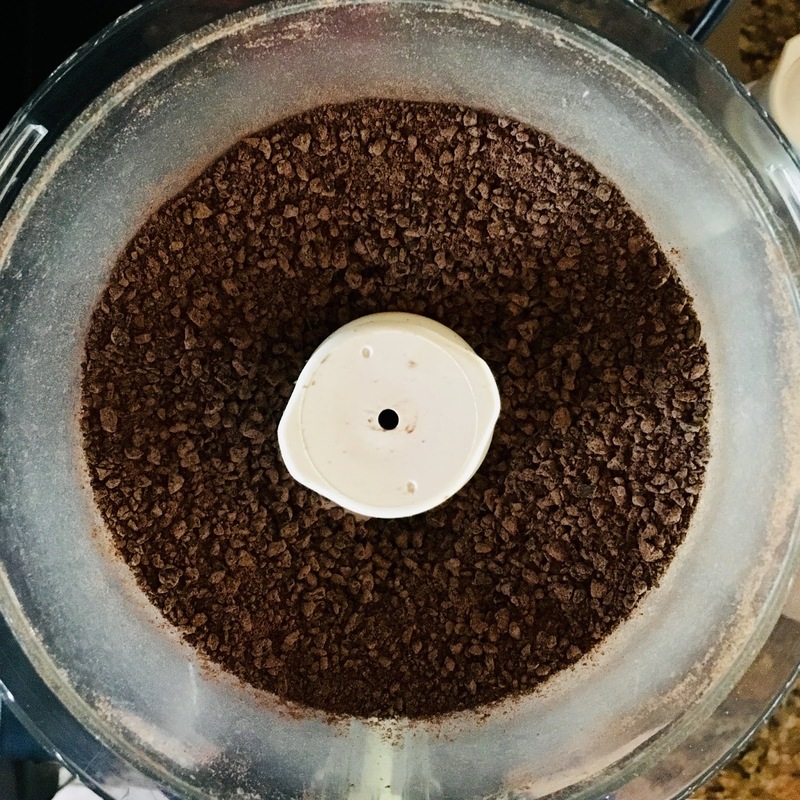 Beat in eggs 1 at a time, then vanilla and chocolate.Gradually add dry ingredients, beating just until combined. Chill dough until firm, about 2 hours. Preheat oven to 350°F. Line a baking sheet with parchment paper or a Silpat. Place powdered sugar in shallow pan. 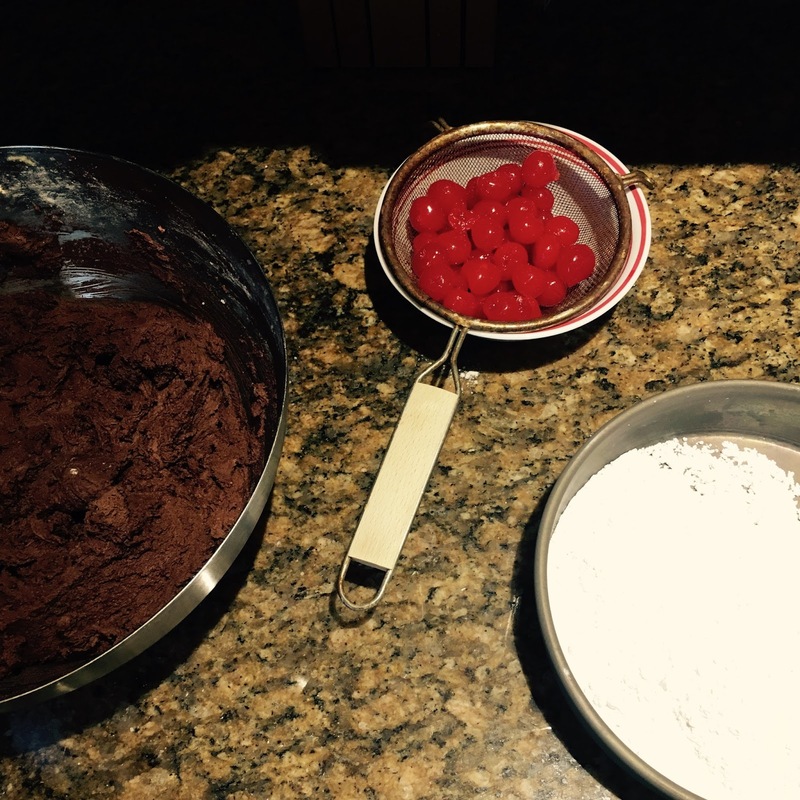 Form dough into 1-inch balls, flatten, and then shape around one maraschino cherry so that the cherry is sealed in dough. Roll each ball in powdered sugar to coat; shake off excess sugar. 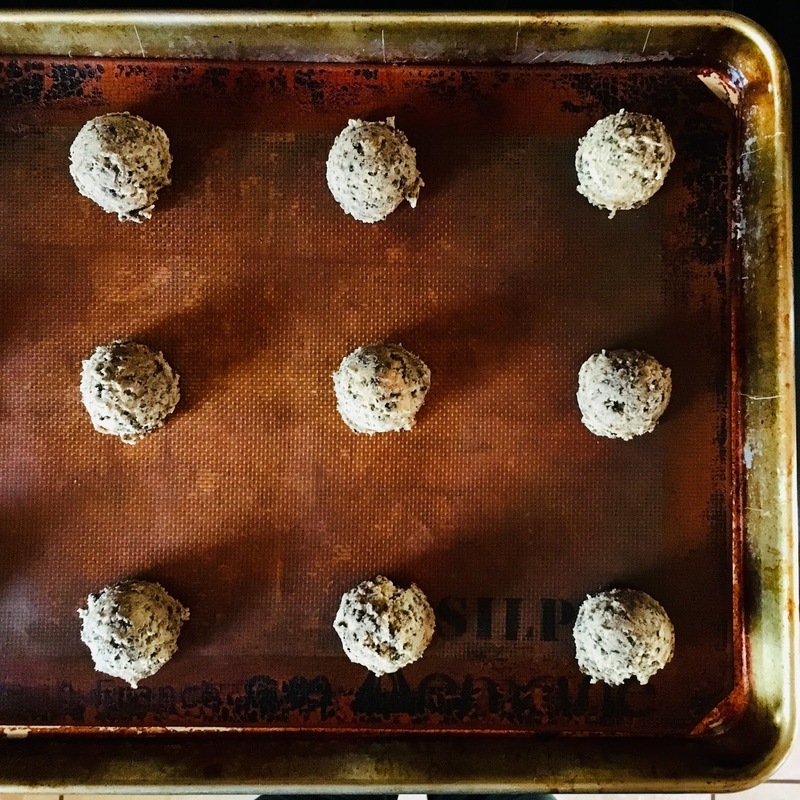 Arrange cookies on prepared baking sheets, spacing 1 1/2 inches apart. Bake until cookies puff and crack but are still soft, about 12-14 minutes. 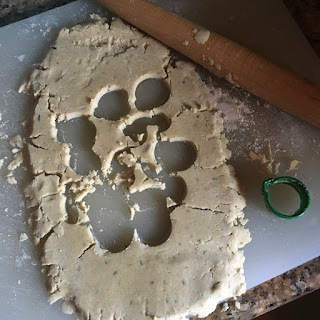 Transfer cookies to rack and cool completely. Makes about 30-36 cookies. Enjoy! 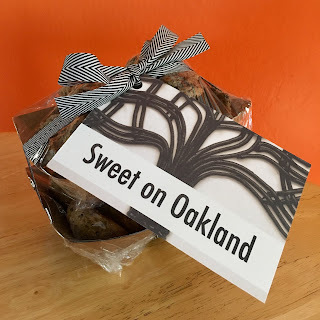 Cookies inspired by Oakland neighborhoods! You can learn more about the baker here. Subscribe to Sweet on Oakland!